A tale of bad sportsmanship in youth sports. Can there be a “win at all cost” mentality, even in a basketball league for kids that are barely 5 years old? There sure can be! My son joined his first basketball team when he was 5 and a half. He really enjoyed the sport, even though he was completely too shy to barely touch the ball. He felt more comfortable just following the “traffic” back and forth across the court. I was fine with that. It was great exposure to an active atmosphere which taught him to handle situations quickly, and he got some great exercise. The company that formed the league was really focused on good sportsmanship and playing for fun and skill development. Their philosophy was that playing an organized sport helps children to grow and understand the basics of team building, take direction from leaders/coaches, learn the basic skills, and develop confidence. The league owner stressed that all players were to be given a fair amount of playing time, no matter the skill level. Additionally, the coaches were to set good examples of the league’s philosophy. My husband filled in as an assistant coach and had a great time bonding with our son, and teaching him about the sport. To help ensure that the league’s sportsmanship philosophy was followed, the league developed a color-coding system among the players. Each player was given a different color wristband and there was a matching player with the same colored wristband on the opposing team. 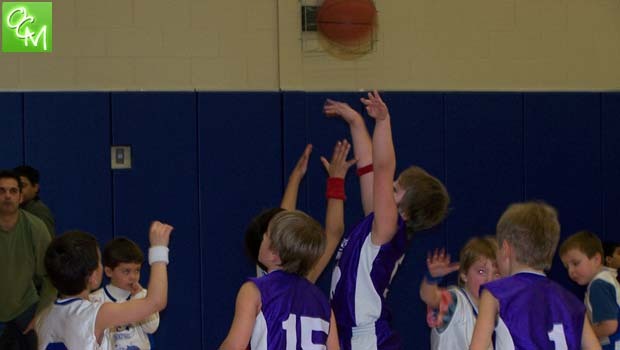 The kids were only allowed to block/cover/defend the player that had the same color wristband. IE – If the “star player” on one team wears a red wristband, the “star player” on the other team wore a red wristband and was assigned to defend him because they were evenly matched and fair. And… if a child struggled or wasn’t a great player, they were to be assigned to defend the other team’s weaker player. This was one of several rules put into place to promote the positive learning experience this was set out to be. My husband and the other coach held true to the league’s sportsmanship guidelines. They encouraged the kids to have fun, follow the rules, and get out there and play. All players on my son’s team got equal playing time, and if a child was nervous or uncertain, they did not pressure him to go out and play. The wristband solution worked and the players even improved playing against their like skill-set opponents. When our team made it to the playoffs (everyone gets to the first round), we won the first game of the series in an evenly played match. The other team was just as encouraging with the kids as ours. My husband and the coaches of the other team even exchanged which players were less experienced and what color wristbands they would be wearing so they could have an even match up and the kids would feel most comfortable, not intimidated. And all players on both teams had equal opportunities to play. Then came game 2 and the Bad Sportsmanship in Youth Sports set in. The coaches on the opposing team seemed to have their own agenda. When my husband revealed our less experienced players and their wristband colors, the other team took advantage and rearranged their line-up. Additionally, we saw them make several last-minute wristband changes so they could stand a greater chance for victory. And finally, the act that hurt me the most, was when they spotted that my son was wearing the gray band, and they immediately swapped so their player who was to get the ball next could also have gray and easily dribble down the court to score. Yes, my son was still having difficulty with the blocking concept. They knew this and took advantage of it. It broke my heart. Luckily, my son didn’t even notice. He was too busy having fun. Needless to say, we lost the game. It’s a shame when the coaches are in it for themselves. These kids were 5 and 6 years old, and even though score was kept, they were never disappointed in a loss. They were happy to have a great time. Why not let them just have fun? Why is it so important to win? And what kind of example were these coaches setting for the children? In my son’s case, I knew what had happened was wrong. But, most sadly, I realized it was most likely only the beginning of what was yet to come as a parent of a sports loving boy. Do you have any tales of bad sportsmanship in youth sports?